It feels eerily coincidental to be posting my Bestovers spin on an American comfort food classic today, of all days. This is a slightly unconventional take on the #1Dish1Week post. There seems to be negative amounts of regularity – and by that I mean none - in my life these days. Not that I'm complaining; keeps things interesting. I am all about spontaneity, but it does mean I am not managing to meal plan, at all, and thus #1Dish1Week at home all week long. While I could make and shoot 5 dishes in a day, some of those plated, ready-to-eat shots you see, wouldn't keep. And in case there was an ounce of doubt in your minds, this blogger eats ALL the food she shoots. So we can’t be shooting just to shoot. Hence the slight delay between these two Harissa-Pumpkin-Seed-Roasted Pumpkin posts. But, the principles hold true - reinventing your leftovers has never been more of an excuse to play with your food. When winter hits you like a ton of bricks, I don't know about you but this body is craving ALL the comfort foods. 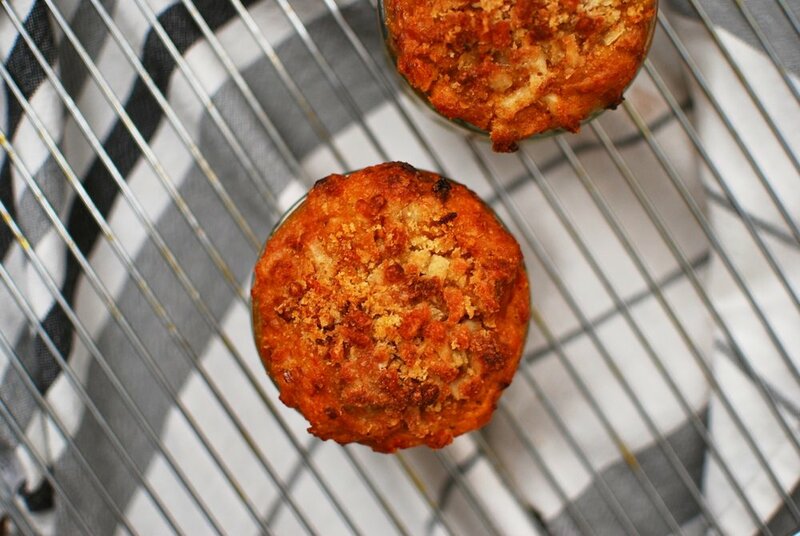 Having never made mac and cheese before in my life - shockingly - but eaten plenty of variations throughout my time in America, I decided pretty promptly that it would be the perfect way to salvage this abundance of roasted pumpkin. And to bring along for our firework-watching-in-the-freezing-cold-for-two-hours picnic. [Accompanied by Pumpkin Chocolate Chip Muffins and Tea, of course. It was quite the picnic. I was pretty proud of myself]. [Oh, and yes, leftovers - though be a little more weary with meat - can keep in the fridge for at least one week; promise me you won't go tossing them after 2 days]. nibs etc. original recipe. Makes/serves 2. Cook pasta for half the time indicated on the packet – Penne needed 5-6 minutes. Drain over a bowl to catch all of the pasta water. Set pasta and water aside. 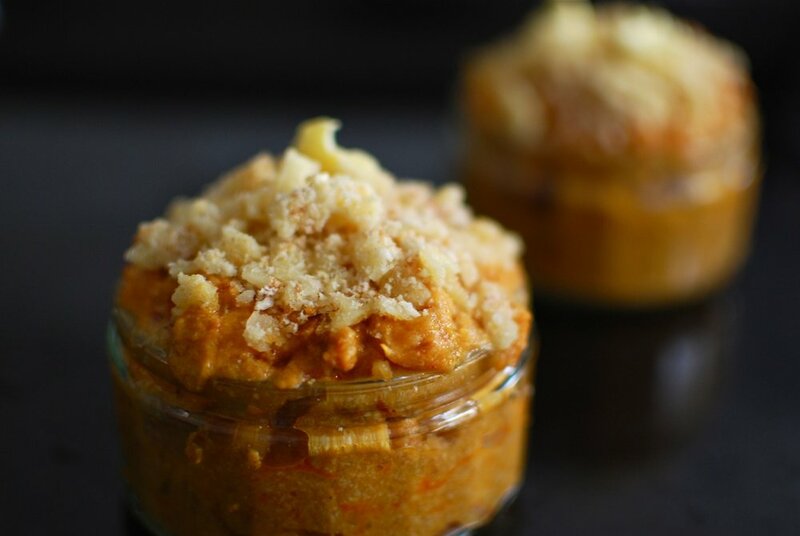 Puree the 2 slices of harissa-pumpkin-seed-roasted pumpkin in a hand blender with 2-3 tbsp of pasta water. It need not be 100% smooth, but about the consistency of mashed potatoes. Set aside. Grate the cheese and slice the remaining pumpkin and set aside. Preheat the oven to 200*C fan/210*C/400*F.
In the same pan used for the pasta, melt half the butter over low heat. When it has turned a light brown colour and begins to smell nutty, add the flour and whisk to break down any lumps – note this will only make a small roux, don’t panic – before adding in the milk, continuing to whisk until well incorporated. 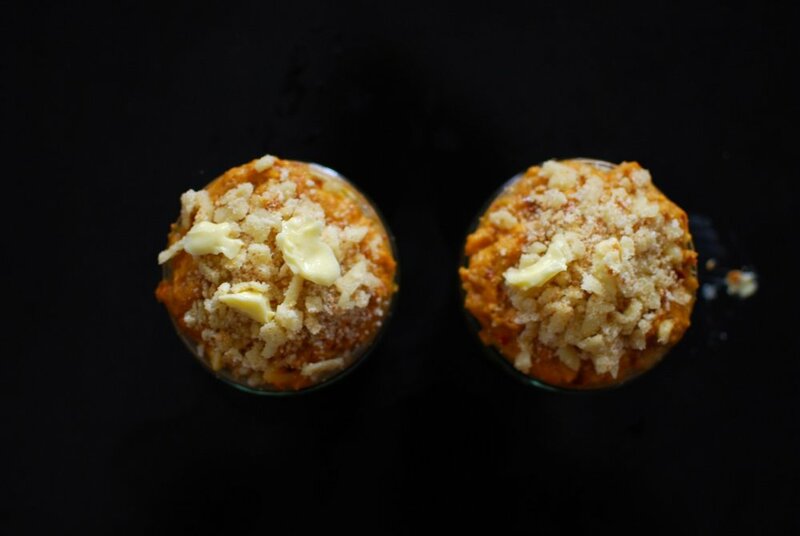 At this stage, stir in the pumpkin puree and grated cheese – reserving 1 tbsp! – and melt together using a spatula/wooden spoon. Once smooth in consistency, add the harissa, pasta and pumpkin pieces. Mix together until all ingredients are well distributed. Turn off the heat. Take two small ramequins, and using half of the remaining 1/2 tbsp butter, butter the dishes before evenly dividing the portion of pasta between each. 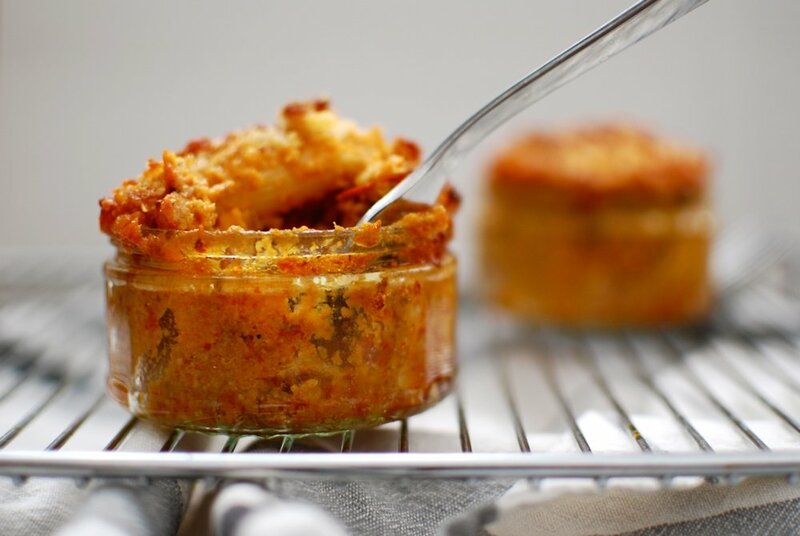 Crumble the remaining cheese with the breadcrumbs using your fingers. Top each ramequin with half the cheese and breadcrumb mixture, before dotting each with the remaining bits of butter. Bake for 15-20 minutes until golden and bubbly. Allow to cool 5 minutes before serving. Then devour immediately and feel your insides sigh with happiness. With a small side salad of rocket and coriander with a drizzle of aged balsamic vinegar. As a single hearty main - recipe is easily doubled or quadrupled for when serving big family and friends gatherings. Served on the side of any large roasted bird (several upcoming holidays spring to mind...). Substituting Penne for any small/short pasta you have on hand: elbow, fusilli, orecchiete etc.